China Zebrafish Resource Center (CZRC) is a non-profit organization supported by the Ministry of Science and Technology of China, and the Chinese Academy of Sciences. 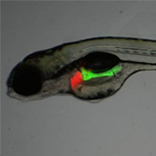 CZRC mainly focuses on collecting the existing zebrafish resources, developing new lines and technology, with the purpose to provide resource, technical and informatic support for Chinese and overseas colleagues. * The CZRC appreciates the Zebrafish International Resource Center (ZIRC) (at Eugene, Oregon, US) for enormous cooperation and assistance. Acknowledging Materials and Services: Please acknowledge the original resource providers and the China Zebrafish Resource Center (CZRC) in all publications resulting from the materials and/or service we are providing to you. Meanwhile, we encourage you to acknowledge the supporting grants of CZRC, grant 2012CB944504 from the Ministry of Science and Technology of China and grant KSZD-EW-Z-001 from the Chinese Academy of Sciences.